Her new Edwardian tiara/necklace wasn't the only piece from Crown Princess Mary's jewelry box that appeared at Bruun Rasmussen's auction in March 2012. Thanks to sleuthing by Arthur from the Royal Jewels of the World Message Board, we can trace Mary's diamond and morganite pendant to the same source. 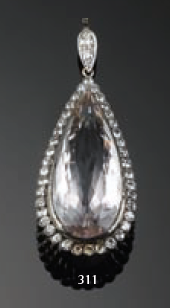 A morganite and diamond pendant set with a pear-shaped morganite weighing app. 39.00 ct. encircled by numerous brilliant and old mine-cut diamonds weighing app. 2.10 ct., mounted in gold and silver. The pendant is 5.6 centimeters long, and the catalogue estimates that it was created around 1930. And it was quite a bargain: the price estimate for the piece was 535 euros, or just about $600 at today's exchange rate. Mary wore the pendant on her pearl necklace at a state banquet for the President of Turkey in 2014, pairing the necklace with her wedding tiara. She also wore the pendant with her pearls in January for one of the annual New Year's receptions.